This is a 2 Player turn-based strategy game made in C++. The objective of Chain Reaction is to take control of the board by eliminating your opponents' orbs. Players take it in turns to place their orbs in a cell. Once a cell has reached critical mass the orbs explode into the orthogonally surrounding cells adding an extra orb and converting the orbs in the surrounding cells in to its own color and hence claiming the cell for the player. The critical mass of a cell is equal to the number of cells orthogonally surrounding that cell. For instance, the critical mass of the four cells at the corners is 2, that of the cells on the edges is 3 and that of the remaining cells is 4. A player may only place their orbs in a blank cell or a cell that contains orbs of their own color. As soon as a player loses all their orbs that player is out of the game. For further details or the source code refer the link below. Recursive Function: This function can be called as the heart of this game. 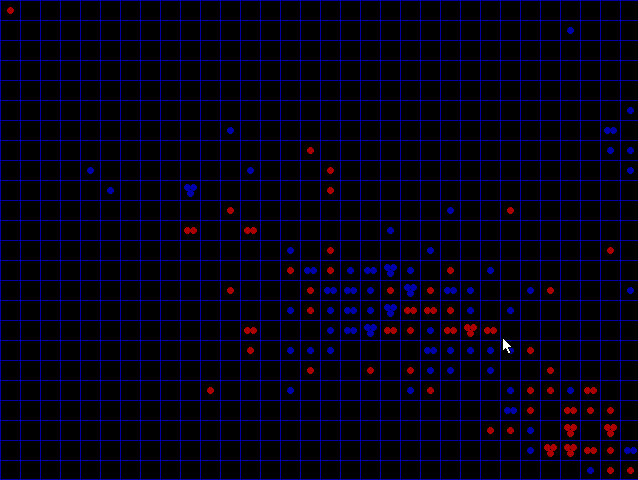 It scans for user input in the form of mouse click and then updates the number of orbs in that cell. It then calls itself 4 times recursively for the 4 surrounding cells and the process continues. Graphics: Graphics.h library is used for all the graphics. A mouse class is defined for the mouse functionality used in the game.